Hilton Head Magazines: CH2/CB2: Lowcountry Clean Care, LLC: Cleaning is what they do — Caring is who they are! We’ve all heard the saying, “It’s not what you know but who you know.” While often cited in the context of getting ahead in life, it also applies to finding the right person to get a job done. You don’t necessarily need to understand the process, but you need to know the person who does. Brant started his cleaning business in 1979, when he purchased a franchise, Guaranteed Systems Carpet Cleaning and Dye, with a focus on wall-to-wall carpet. But as the business grew, he became a sponge, attending seminars and classes all over the Southeast and as far west as Denver, soaking up knowledge about fabrics, chemicals, and the science of cleaning. He gradually transitioned away from the franchise and began offering a diverse set of cleaning services including rug washing and repair, upholstery, draperies, tile and grouting, water damage/structural drying, and more. “What I tell people is I have a lot of tools in my tool box,” he said. One of the biggest misconceptions people have, according to Brant, is the amount of time and energy that goes into his rug cleaning process. “This is not a glamorous business, and sometimes it’s a thankless business, because people don’t always realize what we actually do,” he said. “It’s not a matter of just running a vacuum and throwing it in the washer.” Cleansing sprays and pre-spotting treatments are carefully selected for each rug and every row of knots or fringe, depending on the level of soil, the source or the stains, the material composition, and the color. While Brant is a walking encyclopedia with 40 years’ experience in the cleaning business, he is quick to praise his support staff—a tight-knit, like-minded group, always willing to go the extra mile for the customer. 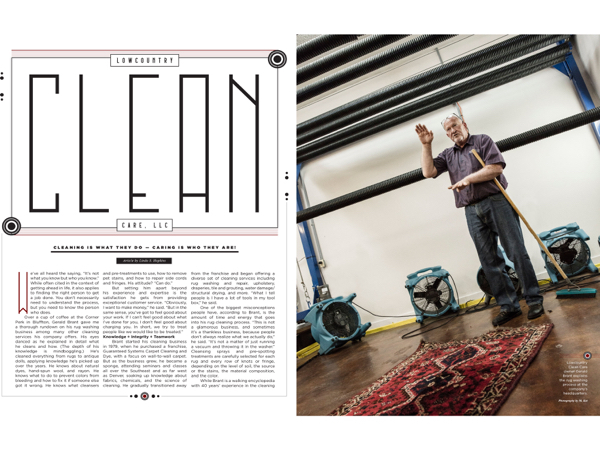 Although rug cleaning and repair is Brant’s primary business, the array of cleaning services he offers today is astounding, especially considering he has only four employees. “People are amazed that we process as much as we do with the number of employees. It’s because of the planning. I’ve already got my plan before I’m there, and then I oversee the execution of it. I’m not going to go on a job unprepared,” he said. Preparation begins with meticulous scheduling, which starts with office manager Jessi Ohl. Employed by the company four years, her responsibilities include answering the phone, scheduling jobs, communicating with customers, preparing gift bags for customers, bill paying, payroll, running errands, etc. “Pretty much I do everything, and on top of that, I do some of the rug repairs,” she said—a skill she learned from Brant. Brant is also grooming a young man, Nathan Owens, who is still in high school but working for Lowcountry Clean Care on weekends and in the summer. “He’s a big boy. He’s my muscle,” Brant said. In addition, new hire Justin Crews is working part-time. “He’s worked for me before, and I can see that he’s grown and matured. He brings a good work ethic,” Brant said. Moseley said he particularly enjoys meeting the customers and the variety of tasks he performs. “When I go to work, I’m doing something different every day. It’s a steady challenge of what’s coming up next. Every job is different. You have to pay attention and proceed as you would want it done and make sure it’s right,” he said. For superior rug cleaning, repair, and much more, get to know Brant and his crew at Lowcountry Clean Care. Experience the difference in quality and service that comes from a company that cares. Lowcountry Clean Care is Master Rug Cleaner Certified. They are located at 27 Cemetery Rd. in Hampton, S.C. They pick up and deliver to all areas of Hilton Head Island, Bluffton, Beaufort, Fripp, Bray’s and Dataw Islands. For more information, visit lowcountrycleancare.com or call (803) 943-4416 to arrange pickup. Gilman Floors, Door to Door Dry Cleaners & The Clothes Press also accept rugs for Lowcountry Clean Care.